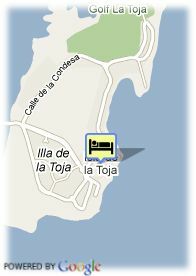 Hotel Louxo is located on Isla de la Toja, with medicinal waters, the rooms have a telephone, television, minibar, drier and heating. There is also a car park, gym, restaurant, lounges, swimming pool and spa, and the possibility to play tennis and do aquatic sports, amongst others. Strand, Centrum, dichtbij snelweg, Panoramisch uitzicht.